The hotel is set amid tropical gardens on a white sand beach overlooking the Indian Ocean. There are many activities here including a wide selection of water sports. Children have their own play area. Days are quickly filled with aerobics, beach and pool games, squash, the gym and beach volleyball, plus two large fresh water swimming pools. 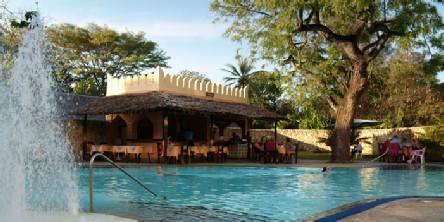 Situated on the north coast of Mombasa. Approximately 45 minutes from Mombasa airport. 150 air-conditioned rooms with shower, TV with DVD player, safe, hairdryer, tea/coffee making facilities and balcony or terrace. 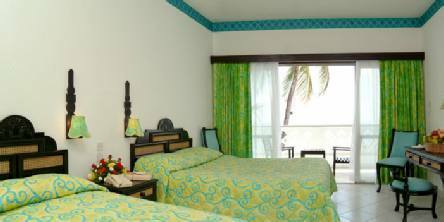 Standard rooms (3 adults) have a pool or ocean view. Leisure facilities include two outdoor pools - one with a jacuzzi and the other with an adjacent baby pool and children's adventure centre - squash, table tennis, fitness room, kids' club (aged 4-12 years) and beauty salon*. Water sports include scuba diving*, snorkelling*, deep-sea fishing, creek safaris*, pedaloes, windsurfing and canoeing. After dinner, the nightly entertainment includes disco dancing, live music, traditional dancers, cabaret shows, acrobats, sketches, bingo and crab racing. *Various charges payable locally. Three restaurants, a snack bar and three bars. ALL INCLUSIVE HOTEL - price includes: MEALS & SNACKS: Breakfast, lunch and dinner - all buffet style. Supplement payable for à la carte service. Daytime snacks served from 10am-5.30pm. DRINKS: Soft drinks, beer, local spirits and house wine - all by the glass - 10am-11.30pm. 2019 package holidays to the Bamburi Beach Hotel, Mombasa Prices are per person based on two sharing, including flights, transfers and accommodation, and are subject to availability. Flights from Heathrow - other departures also available, call for details. Holiday ref: S0517W.